They would steam open all your mail, record your every phone call, track your daily movements, and secretly enter your home to copy any document you hadn’t managed to hide. If they suspected you might harbor anti-government sentiments, they would engage in a years-long clandestine campaign to ruin utterly your personal and professional life—merely to ensure you had neither the time, nor the resources, nor the will to oppose the state. They were the Stasi, the East German secret police, and their Leipzig headquarters was the Runde Ecke. This stately “Round Corner” building now contains a wonderfully homespun “Power and Banality” museum that documents the Stasi era of terror in the very offices from which they waged ongoing war against their own citizens. It’s a surprising and disturbing window into the everyday middle management of running a dictatorship and reflexively cruel police state. 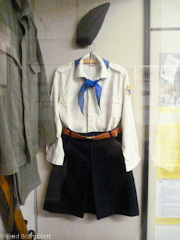 A uniform for a Junior Stasi Agent (you could join in 7th grade). 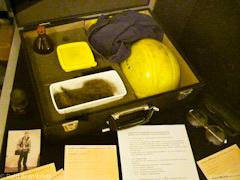 Though the Stasi museum consists of just a handful of oppressively small rooms off a hall done in the dreary institutional yellows and browns mid-20th century, the glass display cases are crammed with the machines and mementos of a secretive state security apparatus. The walls are crowded with photos, documents, and densely-typed explanatory placards—all, unfortunately, in German, making it imperative to plump €3 for the English audio tour to learn the (often bizarre) details behind Stasi methods. 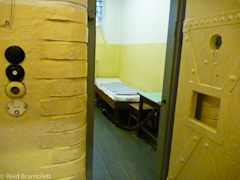 Why did detention cells have two beds? So interrogators could recruit each cellmate to inform on the other. What’s with the jaunty school uniform? You could sign up to be a Stasi agent and begin informing on your school chums at age 13. Did you notice that the handles differ on either side of the doors in the office complex’s antechamber? That was so anyone entering it, either from outside to come in or from the inner hall in order to exit, could simply push down the handle to get into room—but once in, you needed a key (or, more precisely, a Stasi member with a key) to get out. 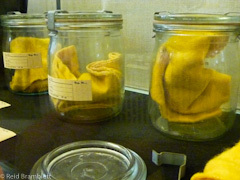 Those accordioned bits of yellow felt individually sealed in mason jars? Suspected agitators would be “invited” to the Runde Ecke for interminable interviews—after which the swatch of felt upon which the suspect dissident had unwittingly been sitting would be jarred. This created a sniffable catalog for trained Stasi dogs to peruse and they tried to match a scent to any anti-government pamphlets and propaganda that popped up. The Stasi Museum doesn’t dwell entirely in chilling Cold War thriller territory. The skeletal “Uncle Sam” anti-capitalist propaganda is almost amusing. As my friend Larry Bleiberg pointed out, there’s more than a hint of Get Smart to the disguise kits Stasi agents would use to keep subjects from realizing they were being tailed by the same person day after day—clownish makeup, false noses, and ludicrous mustaches and beards. Then there are the briefcases containing quick-change outfits. A hard hat, coveralls, wig, and skin-tint were handy if you needed a new identify fast. The most popular disguise, though, was “photojournalist”—then you didn’t even have to hide your camera in one of the false bellies or super-spy corduroy jackets with lens holes in the zippers and shutter release cables in the pockets. Every Monday evening, dozens of Stasi agents and contingents of uniformed police would arrive at the Nikolaikirche on the far side of town to keep a close eye on the church’s regular peace prayers. Under oddly Miami-ish columns fashioned like rococo pink-and-green palm trees, the bishop and notable locals—including Kurt Masur, conductor of the famed Gewandhaus orchestra—would make impassioned pleas for a non-violent revolution. During the Monday prayers of Oct. 9, 1989, the Nikolaikirche was filled to standing-room capacity, and 2,000 people heard the bishop’s call to march on the Runde Ecke—but he had one condition. Everyone must carry a candle in both hands, because if you are carrying a candle you cannot carry a weapon, and if you are not carrying a weapon you give the authorities no excuse to stop you. When the worshippers exited the church, they were met by ten of thousands of other Leipzigers. Every single one of them was carrying a candle. 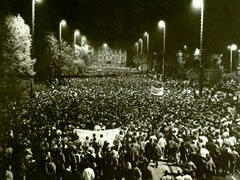 The Oct. 9, 1989, march on the Runde Ecke helped kick off the Wende movement that would eventually lead to the fall of the Berlin Wall and the dissolution of the entire Communist Block—and would spell the end of the Stasi reign of terror.